El Bulli was probably one of the most imaginative and experimental restaurants in the world. Ferran Adria, the chef that transformed El Bulli, is credited with inventing the concept of nouvelle cuisine and molecular gastronomy. Located a 2 hour drive from Barcelona, El Bulli promised the gastronomic experience of a lifetime through a 35-40 course tasting menu costing 250€ per person. 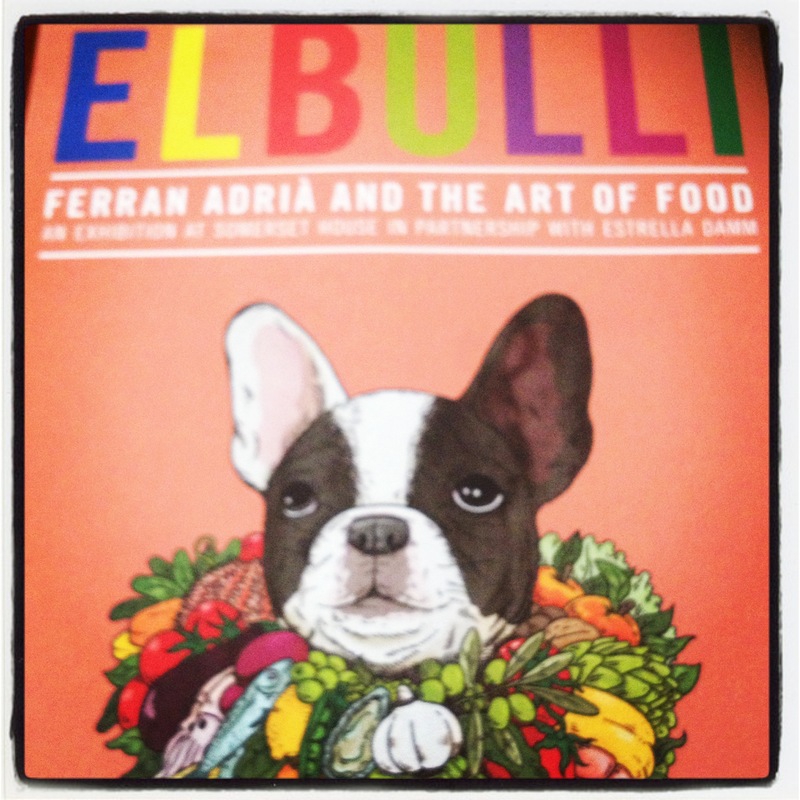 El Bulli was only open for 6 months of the year and needless to say, it was next to impossible to book a table. Despite 2 million reservation requests/year for 8000 ‘seats’, El Bulli closed its doors to the world in July 2011 due to consistent financial losses. 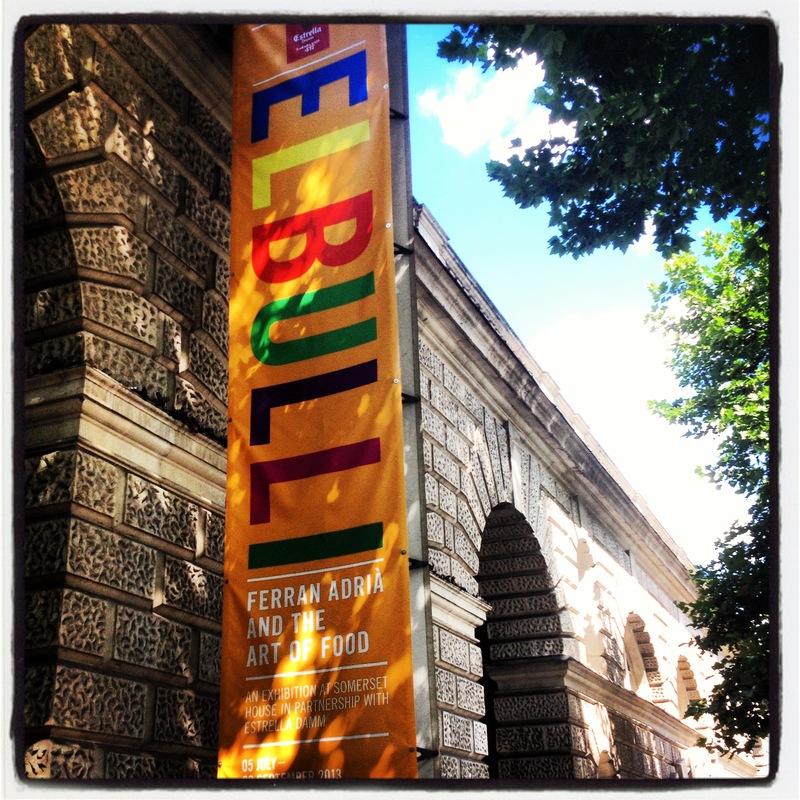 Somerset House in London is hosting an exhibition this summer in honour of El Bulli and quite possibly the best chef in the world, Ferran Adria. I realised that this was probably my only opportunity to experience the spirit of El Bulli and therefore, decided to pay a visit. El Bulli was named after the French bulldog of the restaurant’s first owners. 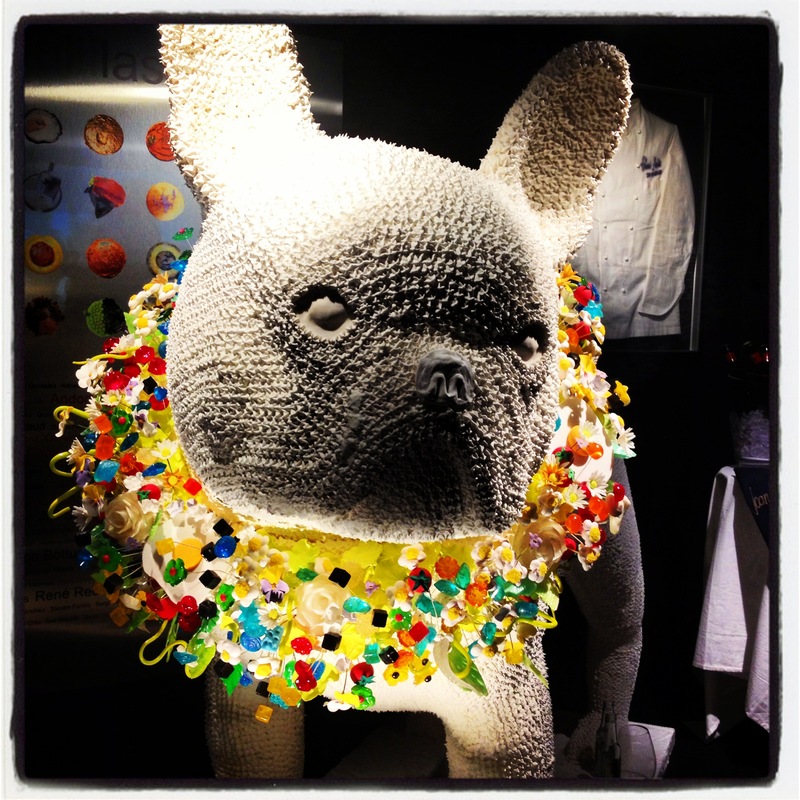 The dog pictured above is 5ft tall and made of meringue with a collar of edible sugar flowers. 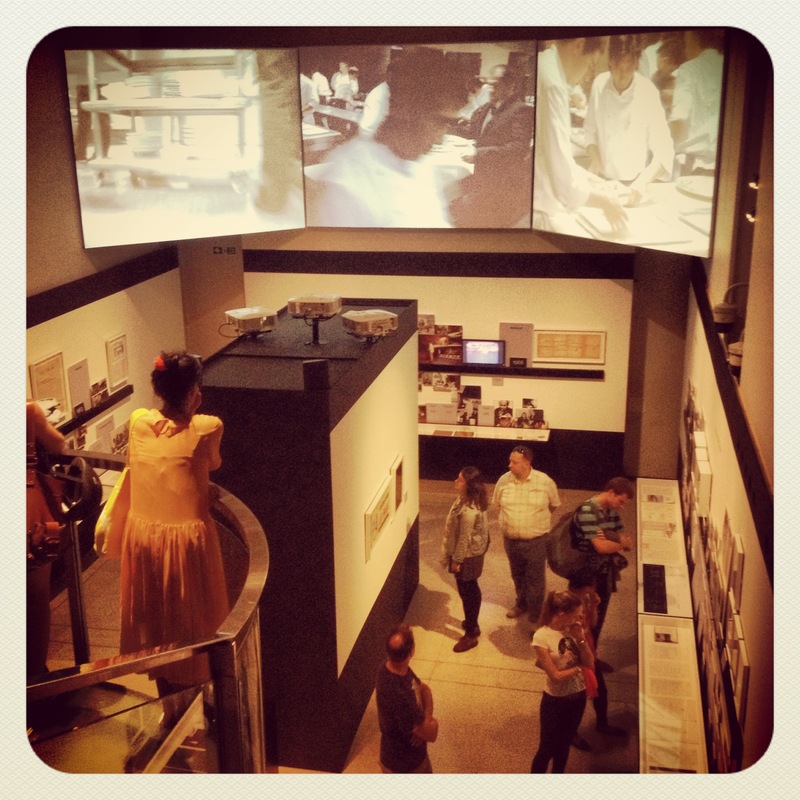 The exhibition relies largely on videos to offer viewers a glimpse in to the El Bulli kitchen and the techniques used by chefs to create culinary masterpieces. 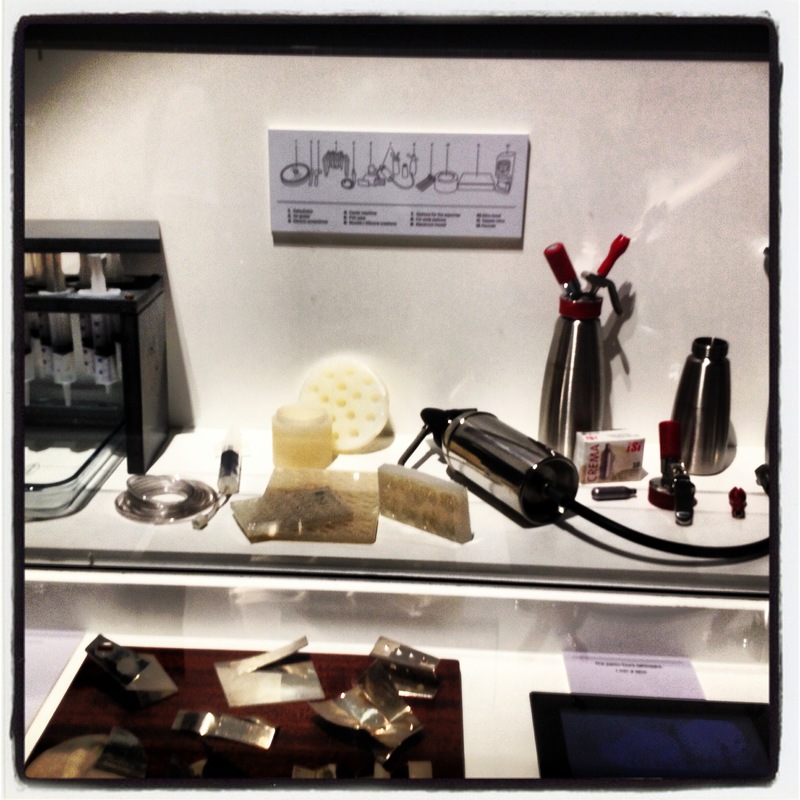 Some home-grown kitchen tools and utensils developed by Ferran Adria and his team. 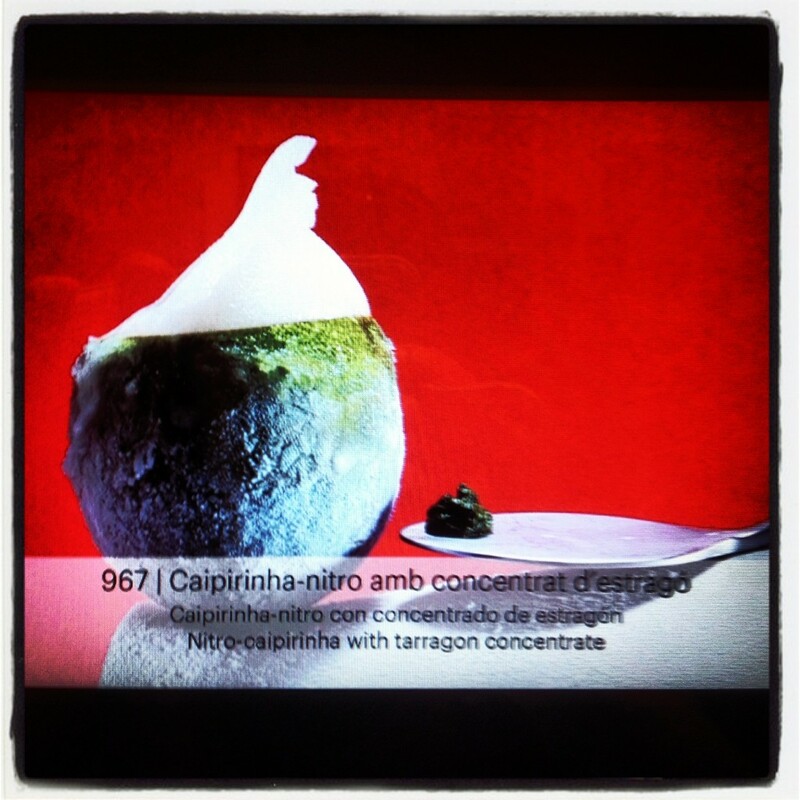 A unique cocktail course marked the beginning of every meal at El Bulli….Nitro Caipirinha anyone? 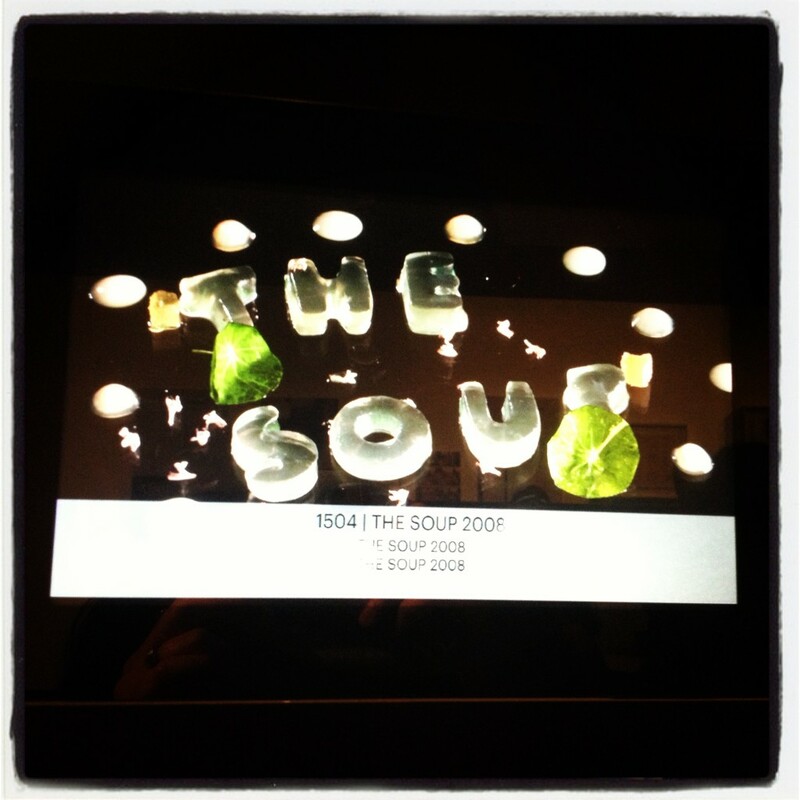 El Bulli’s Letter Soup – each letter was meant to be eaten separately and would pop in the mouth releasing all the flavours. Genius. Ferran Adria created the idea of transparent raviolis that would again melt in the mouth releasing all the liquid contents. The Grand Finale of an El Bulli meal – a delightful chocolate box served at each table. 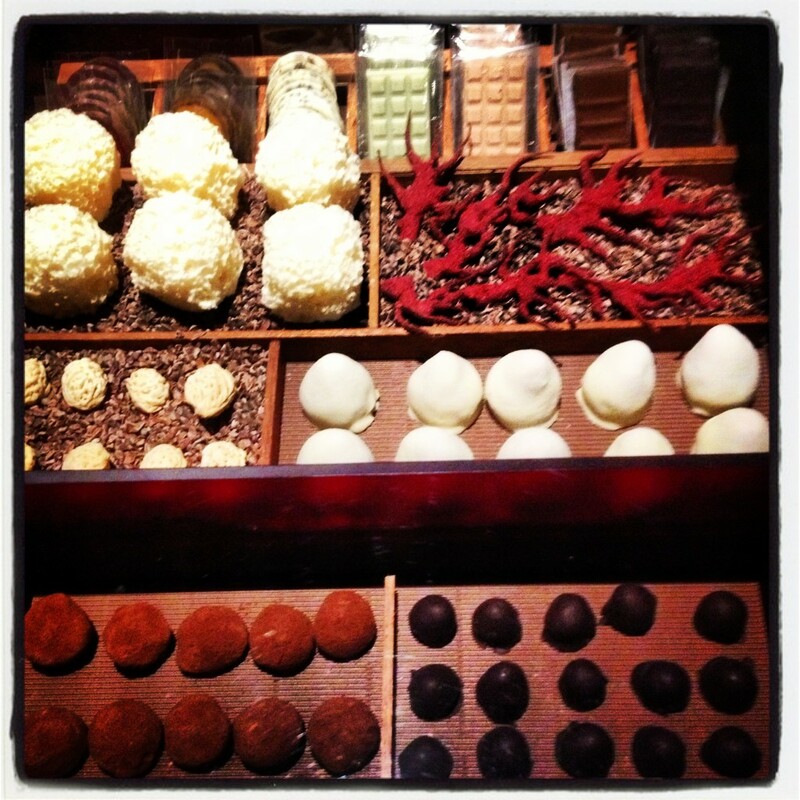 It was not easy staring at this replica chocolate box and not be able to taste any of it. El Bulli will reopen in 2014 as a ‘creativity centre’ and the exhibition will probably feature permanently in the restaurant’s old site. 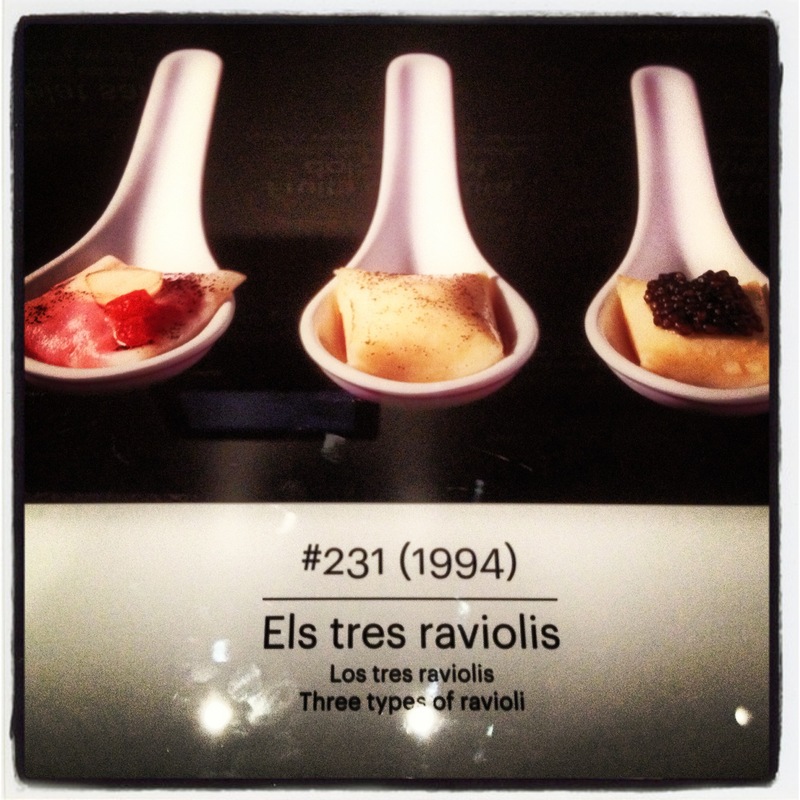 An exhibition worth seeing but sadly, you will leave tempted and hungry and the El Bulli experience will remain incomplete.